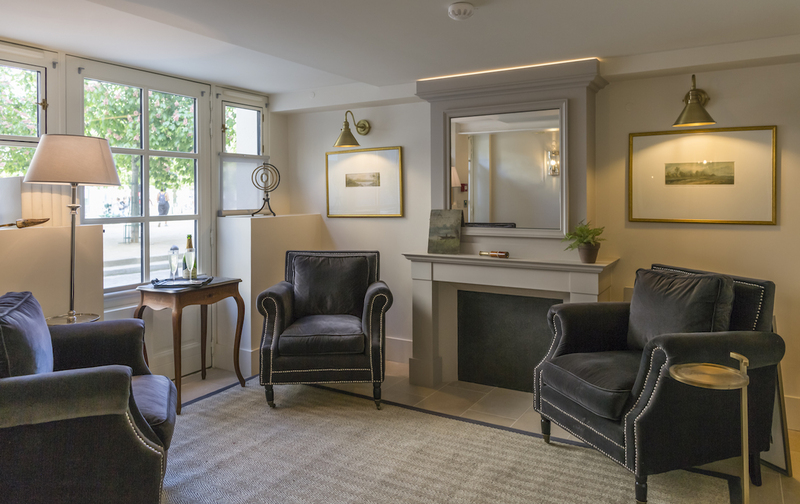 25 Place Dauphine is a remarkable building with six gorgeous apartments and lovely communal areas. The building consists of six apartments: five one-bedroom flats and one two-bedroom duplex. It can accommodate up to 14 guests, making it ideal for a family celebration or group get-together. 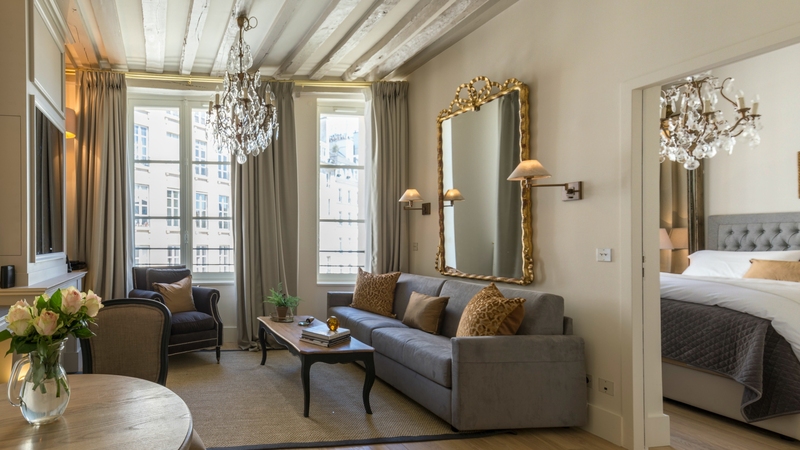 With historic charm, exquisite design and every modern convenience, it's an ideal location to stay in Paris. Proudly sitting on Place Dauphine since the early 1600s, stepping into 25 Place Dauphine is a special experience. 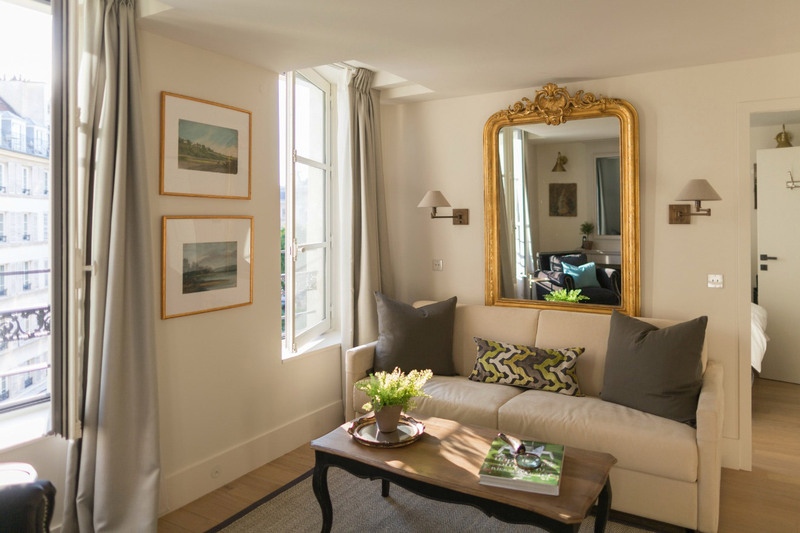 Inside you'll find six beautifully remodeled apartments, each with its own charm and all with views overlooking Place Dauphine. 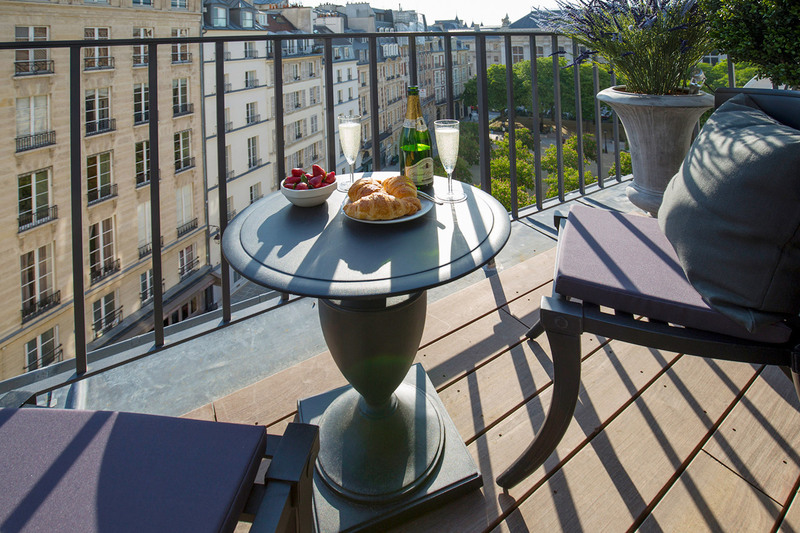 Two duplexes on the top floors feature balconies with views of Notre Dame, Sainte Chapelle and the rooftops of the Ile de la Cité. We know you'll fall in love with this dreamy location and the exquisite design of these very special vacation apartment rentals that combine historic details with every modern convenience. Sleeps up to 2 people. 1 Bedroom, 1.5 Bathrooms. 475 square feet. Spacious apartment located on the 4th floor apartment (5th floor American). 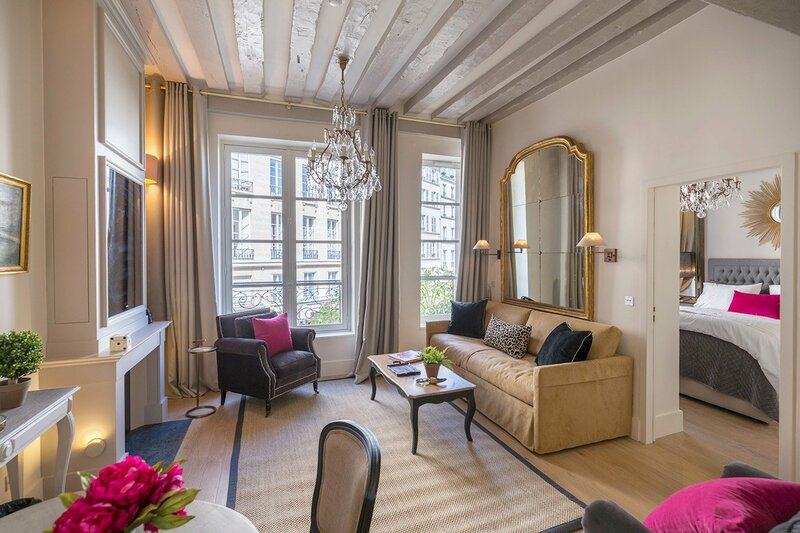 This warm and welcoming apartment looks over peaceful Place Dauphine. You cannot believe that it's literally in the heart of Paris because this exclusive setting is so quiet. This square off the Pont Neuf on the Ile de la Cité is practically hidden away, making it a quiet respite. Air conditioning. Free internet access and free calls. Sleeps up to 2 people. 1 Bedroom, 1.5 Bathrooms. 440 square feet plus 40 square feet balcony. 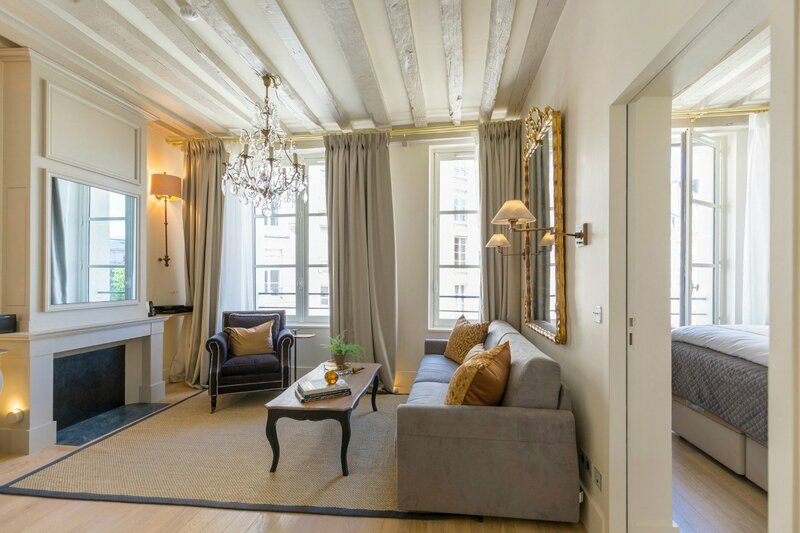 Gorgeous duplex penthouse apartment rental on 5th and 6th floors (6th and 7th floors American) with balcony overlooking Place Dauphine on the Ile de la Cité. Decorated in camel and gray soft tones in the living room, step outside to the balcony to enjoy breakfast or watch the sun move around the spires of Notre Dame. Air conditioning. Free internet access and free calls. Sleeps up to 4 people. 2 Bedrooms, 2.5 Bathrooms. 680 square feet. 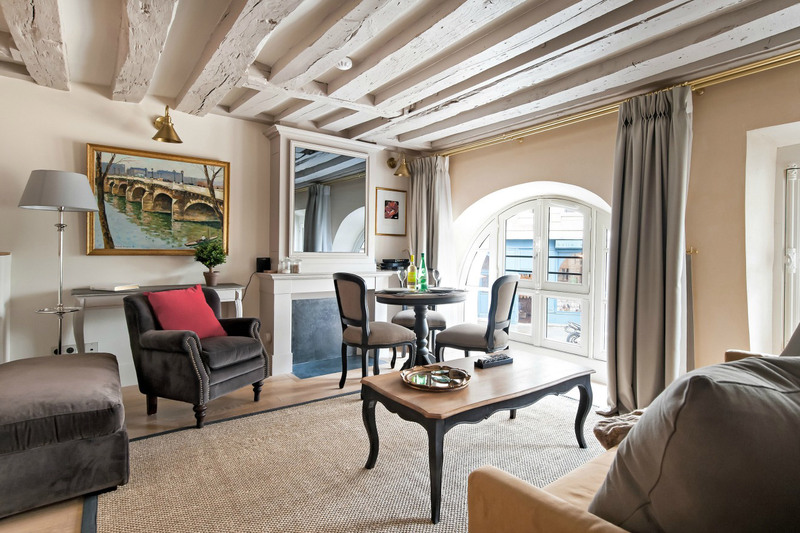 Two level apartment on ground and first floors (1st and 2nd floor American) overlooking this beautiful square on the famous Ile de la Cité. This is one of the most popular apartments at 25 Place Dauphine because it's so cozy and inviting. With incredible historic details, enjoy dining with a view of Place Dauphine! Air conditioning. Free internet access and free calls. Sleeps up to 2 people. 1 Bedroom, 1.5 Bathrooms. 440 square feet plus 70 square feet balcony. 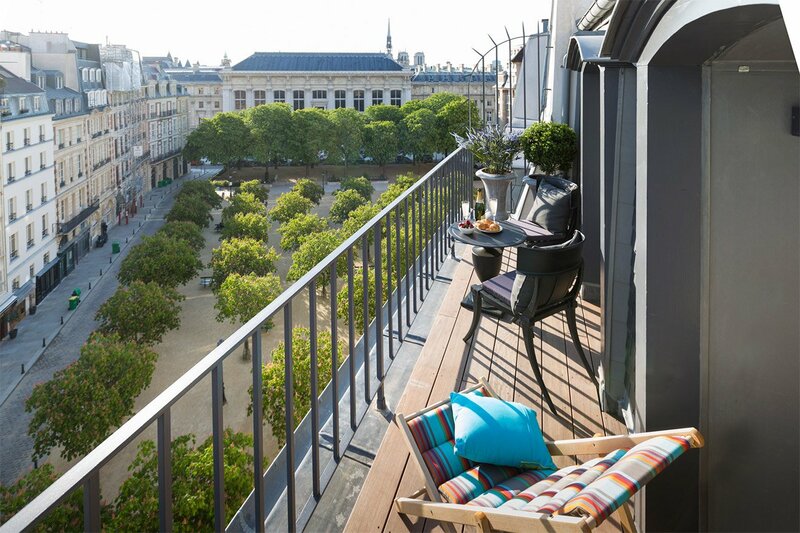 Stunning duplex penthouse apartment on 5th and 6th floors (6th and 7th floors American) features a long balcony overlooking Place Dauphine on the Ile de la Cité. Sip a glass of sweet Savennières wine while savoring views of this gorgeous island where Paris was founded, including Notre Dame, the Conciergerie and magical Sainte Chapelle. Air conditioning. Free internet access and free calls. Sleeps up to 2 people. 1 Bedroom, 1.5 Bathrooms. 475 square feet. Located on the 2nd floor (3rd floor American). Look up to find beautiful chandeliers and the gorgeous oak beams that we revealed during the renovation. In perfect condition, the master carpenters and joiners of the 1600s truly built to last! Beautiful pink accents add the perfect finishing touch to this apartment with lovely views of Place Dauphine on the Ile de la Cité. Air conditioning. Free internet access and free calls. Sleeps up to 2 people. 1 Bedroom, 1.5 Bathrooms. 475 square feet. Set on the 3rd floor (4th floor American). 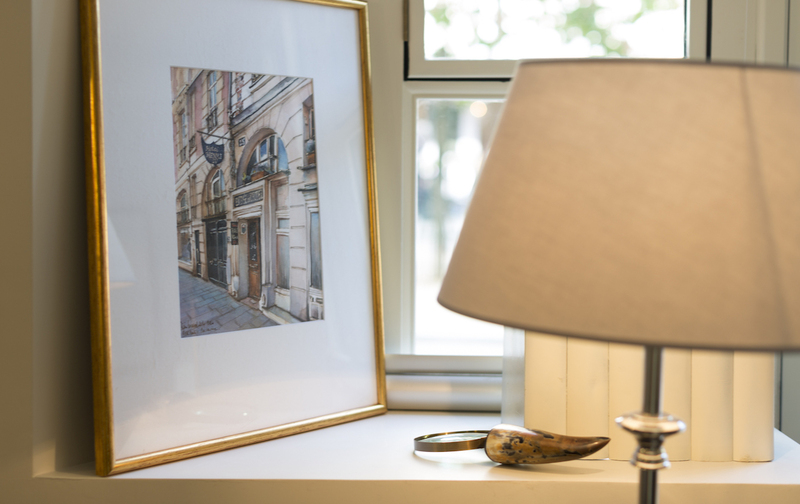 Sunlight streams in each morning from enormous windows that overlook the famous Place Dauphine on Ile de la Cité. We love the bronze silk cushions on the pale grey sofa, the historic wooden ceiling beams and the rich gold details throughout this remarkable apartment. Air conditioning. Free internet access and free calls. Step into the welcoming lobby of 25 Place Dauphine and you'll feel at home from the moment you arrive. 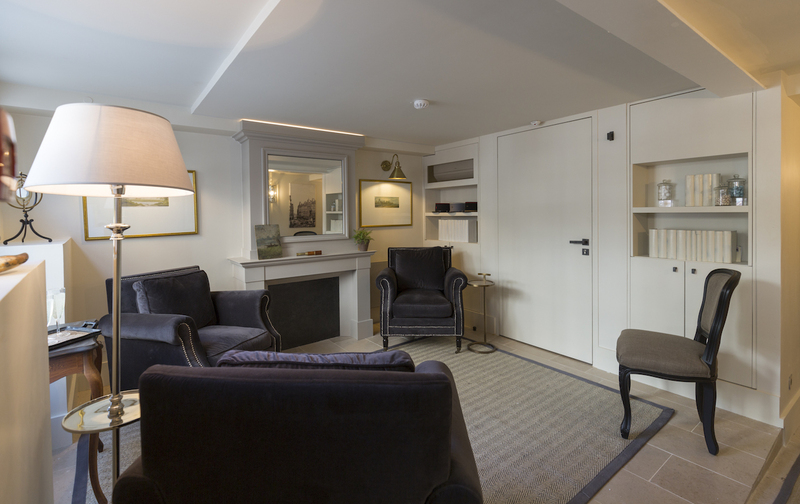 It's a comfortable spot to relax or chat with family and friends, enjoy a book or wait to meet up with your tour guide. After an incredible two year renovation, every detail in 25 Place Dauphine has been completely remodeled and beautifully decorated with antique finds from the local Paris flea markets and décor that is both comfortable and stylish. 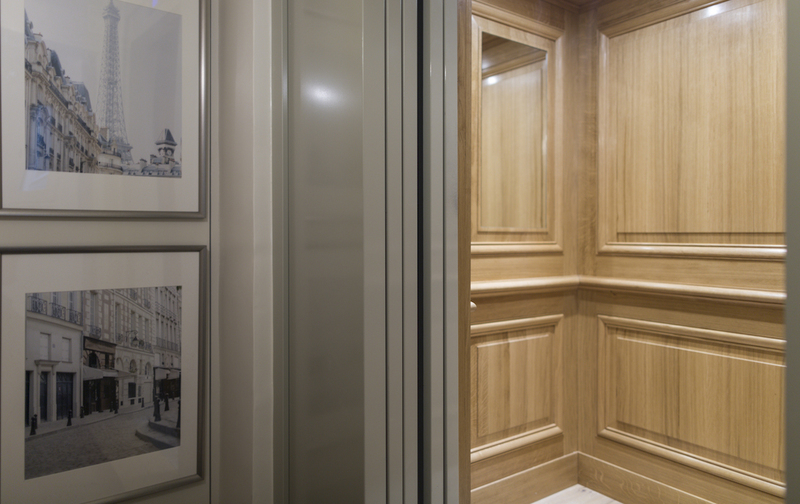 During the renovation, we added an elevator to the building for the comfort of our guests. It is wood paneled and just as finely finished as all of the details in 25 Place Dauphine. You can also choose to climb up the beautiful spiral staircase that is original to the building.